Skin issues, such as pimples and blackheads, always seem to appear on a day you hoped to look your best. 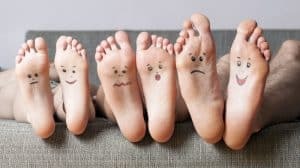 Dreaded black spots, white headed-pimples, red bumps and pores the size of a golf ball – they all put a hold on your plans or force you to go about your regular schedule with slightly less vigor. When pouring over options to rid your skin of dreaded black heads- one thing becomes clear, a detail of your everyday routine must change. Think clearly and realize many are suffering from the same dilemmas and there are viable methods to unclogging pores which are easily attainable. 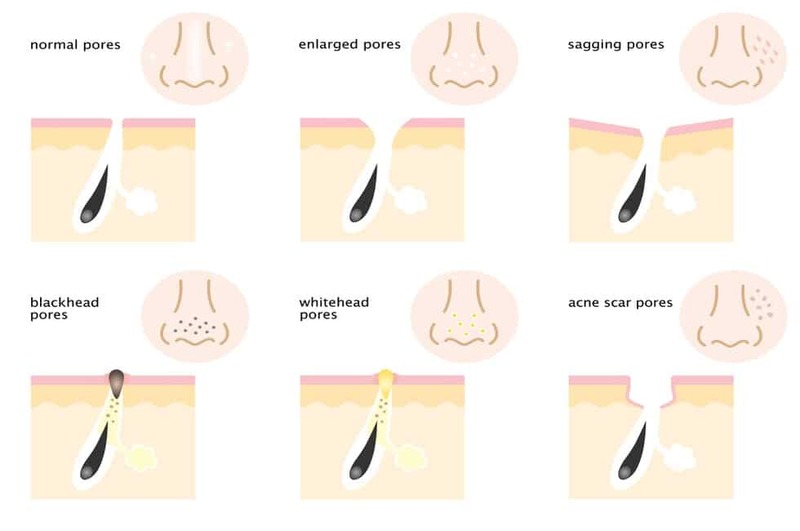 Clogged pores are comedones in different states. You’re familiar with the dreaded whiteheads and blackheads- blackheads are open comedones and whiteheads go by closed comedones. Clogged pores can be blackheads or whiteheads, it depends on how it got clogged, but it all comes down to skin cells and natural oils becoming trapped in your pores. Since a blackhead is open this substance that becomes trapped is exposed to the air it naturally changes colors. How it happens, and why some get more or less of either kind, is largely up to genetics. Even with the same methods of self-care, some people are just more susceptible. Common outside factors that can contribute to the formation of acne are leftover makeup and rubbing or touching your face with dirty hands. No matter, the cause there are solutions to fit your skin type and your style. There are various different approaches you can take to get rid of those yucky black spots. It’s not just unattractive, but it’s also terrible for your skin. The more natural oils in your skin, the more your pores become clogged and this oil can harden under the skin, only appearing as a small black dot. Try a few of these remedies out and see what works best for you. Do not freak out and automatically jump to the conclusion that you need microdermabrasion, each person is different and there are less costly options you can attempt first. Skin care masks come made from all different types of ingredients, but one thing remains the same, the intent is to enrich your skin and leave it looking beautifully smooth. Cream or gel masks for example are designed to deliver the moisture your skin requires, while exfoliating masks are meant to actually rid your skin of the old cells that contribute to acne. Be sure you’re using the right mask for the job and always follow instructions closely to get the best results. This Dead Sea Mud Mask from New York Biology is all about tightening the skin. It is infused with minerals found in the Dead Sea to help with basic acne and the minimization of pores. Use this product regularly every week to start to see results. There are specific treatments centered on the pores themselves. Many treatments will include tea tree oil which is known for properties that promote skin restoration. Large pores that never seem to go away are the most likely to need this sort of treatment. Charcoal is a hot new trend and with Bior’s Pore Strips, its elements of cleansing are taken advantage of. Just simply place the strip over your nose or any small problem area, wait the allotted time, and rip! A little pain never goes in vain for beauty. brightest. Tru Skin has a lightweight feel on the skin and even a small bottle goes a long way! A great addition is how soft it makes your skin. When heat is applied to your skin your pores will naturally expand and open. This works best on blackheads, but can be beneficial to the treatment of whiteheads as well. This is as simple as taking a hot shower and washing your face. It is best to splash your face with colder water after this type of treatment to close your pores again before heading out into the world. This way you don’t leave them open for future blackheads. As a bonus, steam is an excellent way to moisturize your skin as well. What is so brilliant about the K-Skin Nanosteamer is that you can get a focused, high quality steam within the quarters of your own house. And it doesn’t involved you blocking off the bathroom door and running up your water bill. This is a great inexpensive alternative to going to steaming salons which can be expensive. Steam can uplift the natural moisture in your skin and push out the clogged debris stuck, but it must be done more than once for you to really see a difference. In microdermabrasion, a professional (usually at a salon) will apply a fast-working chemical to your skin. This will remove the top layer of grit seeping its way into your pores. It should not be done various times in close range because too much of the harsh chemicals can leave your skin red and irritated. This is the same reason these procedures are best left to professionals who know the ins and outs of these concoctions. Factors such as puberty hormones, stress, or certain medications may be a contributing factor to one’s forehead acne since they cause this region to produce more natural oils. However, the biggest culprit is often greasy hair products that reach your forehead throughout the day. If you can pinpoint the cause, then you can find the remedy that goes with it. Keeping your forehead clean and preventing any oil build up will be the first step to solving this issue. If this is not the case and full facial treatments don’t seem to do the trick, a dermatologist might be your best bet. This type of doctor specializes in skin care and can help find the source and solution for your ailment. One easy solution many people know of is pore strips. 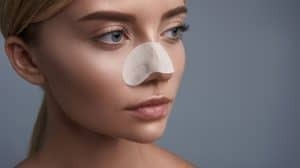 Pore strips are simple, a strip of material with a light adhesive on one side to be applied to your face, many are shaped specifically for your nose. Once the adhesive is set peeling the strip from your nose will bring blackheads with it but doesn’t do as well for whiteheads. Remember while washing to scrub in the corners of your nose. This area is very easy for debris to become trapped. That is why you will notice the corners of your nose are often one of the most populated areas for acne. Popping zits may seem like a quick and simple solution but in reality it should be avoided for the most part. Studies have shown that this technique can introduce additional crud from your fingers which can help start more blockage for the other pores in the area. If your skin bleeds while popping you could be causing a permanent scar or an infection. Popping pimples can even make the situation worse for something under the skin if it is not ready yet. While getting rid of the acne you have is important the best defense is prevention. There are many methods that have been designed to help you ward off the zits to begin with. Experiment with techniques to see what works best for you. The first step for anyone who suffers from acne should be however to simply try more soap and water. People often forget in the shower to wash their face with soap. Running water alone does help but soap will be able to remove built up oils far more efficiently. There is a negative side to this; if your skin is prone to drying out, you can experience more of this with repeated washing. To prevent clogged pores, consider attempting to minimize the size of your pores to ensure they are less likely to become clogged. There are variances between people and their pore size. And in this case, bigger is definitely not better. Start with the very basics, and try to take control of your pore size to make harsh craters less noticeable. Types of facial masks that specialize in tightening skin are a good first start for this particular issue. Laser treatments will run on the pricier side of the options, but it will prove the fastest. The scientific research behind these laser treatments has lead it to become one of the most efficiently working solutions. In this procedure, laser technology is used to smooth skin and that will lessen the depth of large pores. It will also serve to cleanse them. The precision of a laser is unmatched and the extensive testing that’s gone into them will show. The benefits of drinking plenty of water throughout the day cannot be understated, it’s not only washing your face that water comes into play. Your health and attitude will be elevated, but it will also do wonders for the appearance of your skin. Clogged pores, and even just large pores, can become diminished in appearance when you become dehydrated. When you drink a healthy amount of water, your skin cells will stay more hydrated, keeping them from flaking off and combing with oils to form acne. It should go almost unsaid that the key to healthy luminous skin is to wash your face regularly and thoroughly. The key is in having a great face wash that cleans, but does not damage your skin. It could become a problem if the wrong cleanser for your skin is purchased. Anything with added moisture will only work to make your skin more oily. You want to find a brand that understands the need for balanced PHs and that not all cleansers will work for everyone. Regular body soap can be great if it is unscented, but if you can purchase a cleanser specifically for your face, you have a better chance of seeing real improvements. It is always great to be able to find a great efficient product that is also organic! Harsh chemicals can cause more damage than good if used improperly but organic materials always remain a healthy alternative. Matcha is not just for consuming anymore – like most teas, there are benefits to using the leaves for healing or even, in this case, rejuvenating. The key to this product is how it focuses on unclogging pores. Try to use a toner afterwards to protect your freshly opened pores after use. No one ever wants to look in the mirror and see themselves covered in blackheads, but it’s a reality we all face. Sure, It may take time to pinpoint the exact cause and cure for your acne, but don’t give up. Everyone’s skin is different so you may have to experiment to find what is best for your skin. Do not underestimate daily maintenance. Be honest with yourself and your daily routine. Make time for simple changes and your skin will reap the benefits. Using a solution or simply washing your face on a regular daily basis is the best way to keep your acne in check. Even if you are not suffering from a outbreak or frequent clogged pores, always take steps in the direction of prevention. If you don’t keep up your maintenance you could easily wake up back at square one. Your skin works full time and will have to as well to provide the care and attention that keep it looking its best.